While iOS users aren't going to get excited about this (because the feature we are about to describe is already part of the OS and has been since day one), the newly revised TouchWiz clock and calendar (S Planner) icons on the Samsung Galaxy S6 and Samsung Galaxy S6 edge show the real time and date. Perhaps this doesn't make you jump off your chair and scream "Hooray!," but surely there are quite a few of you out there who are thrilled with this new feature. If you plan on staring at the clock expecting a sweeping second hand, forget it. The clock changes time only when the screen is unlocked. Are these new icons responsible for the 20 million in orders that Samsung has received for the Galaxy S6 and Galaxy S6 edge? Uh, no. But it does show the lengths to which Sammy was willing to go to improve TouchWiz. 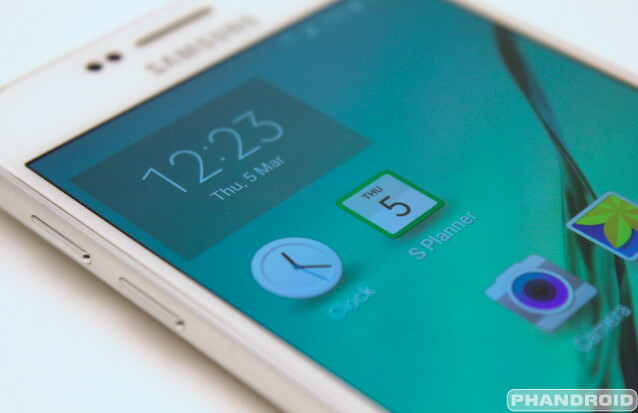 Samsung has been criticized in the last few years for TouchWiz. Many have complained about the cartoon-like look of the icons, something that Samsung has done away with this year. Then icons of the apps show rea time info. They are semi widgets. hello maherk troll ,how are you?? pretty busy trolling in evry article? Where did you see the trolling in my comment you knucklehead? The stock Google Calendar app always shows 31. The icon doesn't change with the day like it does for iOS. This new TouchWiz calendar app changes the icon for every day. My google calendar app icon shows the date in real time changing automatically everyday. Not sure if it's default or because I have the moonshine icon pack. MIUI had this long before iOS7. And we all know how much of MIUI became part of iOS7. I don't really understand. Does Android phone have this one for years? Just like apples isn't it? What? iOS users many years ago were excited by the simple fact they could finally send photos by MMS and do a video on their phone. You're confused. Tim Cook works for Apple and if anything they've been nhelped by neanderthals to advnce so little in so long a time. I'm so confused was it showing the wrong time before? Someone help me understand this. How about an always "on" clock and notifications like Nokia? The icon will now show the real time. I never noticed his, so its not something I ever knew was missing. Lol... Cartoonish chheerful look is a disadvantage? Then go away and use dark and boring UI and don't write nonsense. "Copy" is another token term that is often overused and has its definition of context diminished when it's flaunted around endlessly to satiate some extreme techno ideologues. It's right up there with the constant overbearing and misuse of the word "innovate"
LOL! I love all the confusion on the comments. I was confused too at first. My Note 4 calendar icon already shows correct date?